Airbnb Collections for Work Trips: The Perfect Change for Teachers Traveling Using Airbnb? Many online teachers are traveling using Airbnb to book accommodations-in fact, most of our Connected Classrooms members have added to the map are Airbnb rentals! But the point of Teach Nomadic has always been to help online teachers find the best locations to teach from around the world, and Airbnb’s original filtering system just didn’t cut it when it came to searching their listings for reliable wifi. Just recently, however, the giant rental and hospitality company made a huge update to their platform that helps us all out! Read on to see why Airbnb’s Work Collections is the perfect change for online teachers booking accommodation around the world! ‘Airbnb for Everyone’-What are Collections? In a push to cater to all types of travelers, from those traveling with families to those traveling for work, Airbnb has added more accommodation types and additional filtering criteria. This makes it easier for you to find the rental you want for yourself or for a group. According to Airbnb’s new updates, the introduction of Collections offers rentals for Family Trips and Work Trips, with plans to expand to offer ‘Honeymoon rentals, Wedding rentals, Social Stays, Dinner Party rentals, One-of-a-kind stays, and Group Getaways’. While the Group Getaways may eventually overlap with Work Trips, the latter is the Collection we’ll be focusing on in this post. Beyond by Airbnb, ‘extraordinary homes with full-service hospitality’. They’ve also updated their host requirements, ensuring a better experience for guests. It’s an exciting time at this popular rental company, so let’s check out what this means for online teachers and Teach Nomadic members! Work Collections by Airbnb will make our job of adding new Connected Classrooms to the map here at Teach Nomadic easier, and yours too if you want to help! We can now search for homes specifically catering to individuals traveling for work, and this means us online teachers in search of the ever-elusive reliable internet connection. Just visit the Airbnb homepage and scroll down until you see Homes for Your Kind of Trip. Click the image labeled Work, and you’ll be taken to the page shown in the photo below. ‘2000+ homes for work trips’! Plus, with the updated and enhanced basic host requirements, we’ll be able to contact the hosts to get our internet questions answered with greater confidence. My grandma watches the place and she can’t figure it out. I don’t have time. It isn’t reading the speeds accurately. This is just the connection speed between the host’s device and the testing server and not necessarily the speed or stability between their device and the server located near your students. If you teach for VIPKID, for example, ask the host to try to run a speed test connecting to a server in Beijing, since your students will be located in China. Check out this post on Lifewire for the complete list of 5 rules for a more accurate internet speed test. Work Collections from Airbnb offer online teachers a great new way to filter through accommodations so we can book confiddent we’ll have privacy to teach in, flexibility to check in, and stability in our internet. I encourage you to head over to Airbnb and play around with the filter. See if you can find any locations near you to teach in, even for just a night. If it’s stable and teachable, add it to the map! I know I can’t wait to book my next trip and test it out! 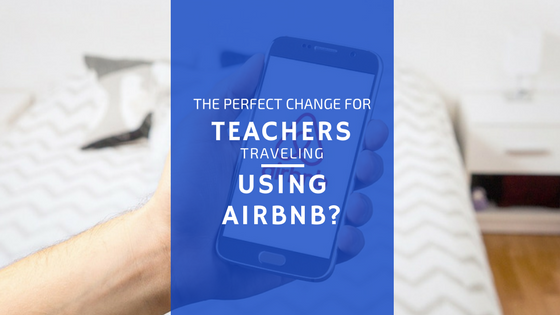 What other filters or features should Airbnb add that would help online teachers? Let us know in the comments below! This entry was posted in Best Tools For Teaching Online, How to Teach Online and tagged Airbnb, internet speed, travel. Bookmark the permalink.